"George the Second pewter CHARGER with lipped rim. 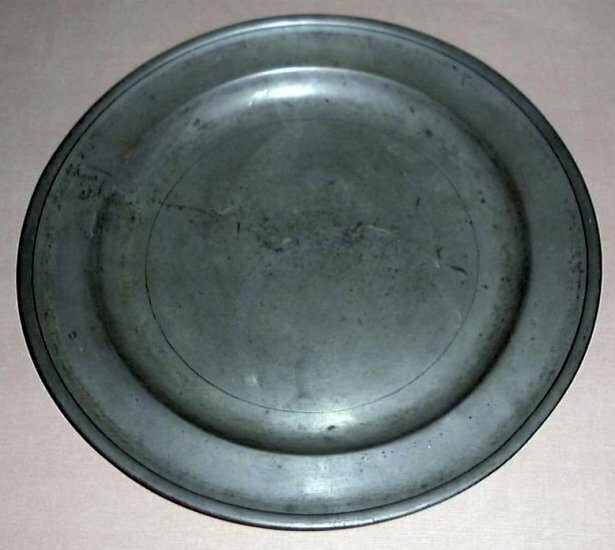 A rare type, originally part of a magnificent pewter Dinner or Supper service. Used in old English Inns & in many stately old English Baronial Manors & Mansions. This specimen was Made in England, ca. 1730-1755." The charger does have touchmarks on the back that are shown in one of the photos. The part that is decipherable to me is LAUGHER with LONDON underneath.There is symbol on the right side of that that I can't make pit and another on the left that looks like a rosette with some letters above it that appear to be W(? )TER, being the last letters of pewter, maybe? On the front is the single letter "G". It is 13 1/2" in diameter. It has a wonderful patina on the front and is darker and grainy on the back. There is a 1 1/2" hairline crack that is visible in 2 of the photos, one front and back.